WASHINGTON, DC – June 11, 2012 – The US Pan Asian American Chamber of Commerce Education Foundation (USPAACC) officially unveiled its 2012 list of Fast 50 Asian American Businesses during the Excellence Awards Gala, at its flagship CelebrAsian Business Opportunity Conference, on June 5 at the Marriott Bethesda North Hotel & Conference Center in Bethesda, Maryland. Their Founders, CEOs, COOs and Presidents flew in from all over the country for the black-tie event. 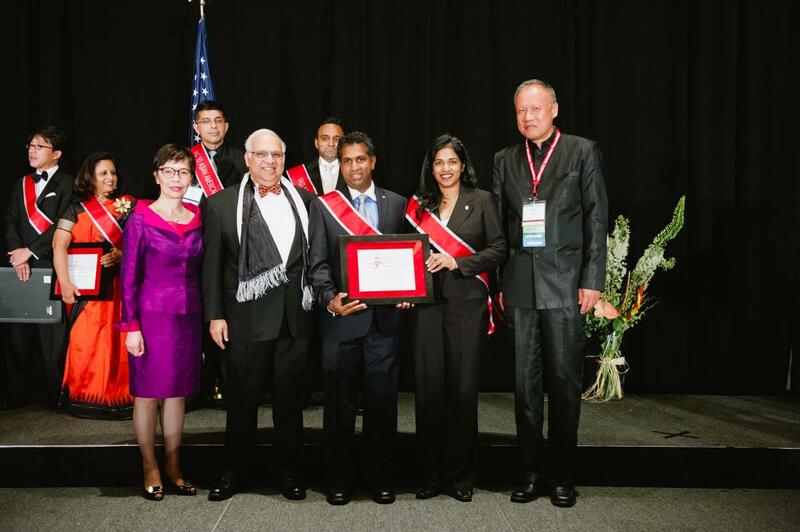 Jayaraman Gnanasekaran of Commercial Lynks, Inc. received the award from USPAACC National President & CEO Susan Au Allen, Conference Co-Chairs Ravi Saligram, OfficeMax CEO, and Kyle McSlarrow, Comcast/NBCUniversal Washington, DC President, and Asian American Business Co-Chair Ken Xie, Founder, President & CEO of Fortinet, Inc.
Based in Alexandria, Virginia, Commercial Lynks, Inc. (CLI) is an export house that specializes in North American agricultural commodities and consolidated food products. With a diverse portfolio of products and dedicated staff, CLI is able to offer consistent quality products and efficient delivery. On the home front, CLI works closely with farmers, elevators and producers in order to create a sustained market for U.S. agricultural products worldwide. While India and Far East Asia represent a significant portion of the company's foreign market sales, the firm does business in several other regions of the world, including South America and the Middle East. Over $4 billion in revenue were generated by USPAACC’s 50 Asian American businesses last year. They represent a wide range of industries nationwide — supply chain management, healthcare, professional staffing, food wholesale, IT, environmental, green energy, media, etc. The businesses represent Americans of Chinese, Filipino, Indian, Japanese, Korean, Malaysian, Taiwanese and Vietnamese. The revenues and growth rates were cumulated, verified, ranked and officially revealed at the Gala by Ernst and Young, the Fast 50 Ranking Sponsor. To qualify, companies must be owned (at least 51%) and managed by one or more Asian Americans (U.S. citizens or permanent residents) and with at least $1 million in annual revenue in the immediate past 3 fiscal years of operation. Through direct applications/nominations, selection was determined by percentage revenue growth over the past three years. Finalists were independently verified by the accounting firm of Ernst and Young. CelebrAsian is the oldest and largest annual national pan Asian American business conference in the United States. Every year, CelebrAsian provides American and other small and minority businesses wide access to contract opportunities and jobs in growth industries, strategic solutions and best practices to thrive in the current market. It also connects hundreds of top-caliber Asian American suppliers and business owners with buyers from Fortune 1000 Corporations, the Federal, State and Local government, and the small and minority business community, through pre-scheduled one-on-one business matchmaking meetings, informative summits, workshops, and networking events. Held June 4-6, the Conference theme was “The Future is Now: Seize It & Win It.” Corporate Co-Chairs Comcast/NBCUniversal, Marriott International, OfficeMax, PepsiCo, and Wells Fargo were also represented at the Gala. CelebrAsian 2012 hosted more than 70 Fortune Corporations, 15 Government Agencies, seven Media partners. All came to meet Asian American businesses and suppliers in various industries and brought over 90 different types of commodities that needed to be purchased. In all, 600 Conference participants came from all over the country for the 3-day business event. ABOUT COMMERCIAL LYNKS INC: Founded in 1999, Commercial Lynks Inc. (CLI), is an International Trading Company specializing in exporting North American Agricultural Commodities and Consolidated Food Products to our customers worldwide. As an export house, we source commodities, arrange Inland Transportation and Ocean/Air freight and deliver the products to our customers in a manner most efficient with respect to price, time and service. We specialize in containerized and bulk shipments to all major destinations. ABOUT USPAACC: Founded in 1984 as a non-profit and non-partisan organization, USPAACC is headquartered in Washington, DC with Regional Chapters in CA, TX, NY, GA, IL, DC-MD-VA National Capital Area. USPAACC is the single unified voice for equal opportunity for Asian American businesses. We promote and propel economic growth by opening doors to business, educational and professional opportunities for Asian Americans and their business partners in corporate America, government at the federal, state and local levels, and the small and minority business community. For 27 years, USPAACC has served and will continue to serve as the gateway to large corporate and government contracts, top-caliber Asian American and small and minority suppliers, key information about Asian Americans and business opportunities in the dynamic Asia-Pacific market.